Green tea has been known as one of the healthiest things you can drink for centuries. It has been a commonly consumed beverage known for its significant health benefits since 2700 BC when Chinese emporer Shen Nung discovered its detoxifying effects. It improved blood flow, maintain stable blood sugar levels in diabetics, lower cholesterol and blood pressure and help protect against damage incurred by a high-fat diet. These health-promoting effects of green tea are mainly attributed to its polyphenol content. Green tea is 30% polyphenols by weight, mainly flavanols and flavonols. Flavanols are mainly in the form catechins, which are antioxidants and include epigallocatechin gallate (EGCG), epigallocatechin (EGC), epicatechin gallate (ECG), and epicatechin (EC). Of all of these catechins, EGCG is the most abundant and beneficial. Together, green tea induces multiple favorable effects on white adipose (fat) tissue that facilitate weight loss. Is has been suggested to play a role in weight management through its modulation of fatty acid oxidation via interaction with the system that controls our fight our flight response – the sympathetic nervous system. Evidence supports its ability to eliminate fat, to the extent that green tea is even being studied as a potential tool in the fight against the obesity epidemic. Further, in mice studies on catechin intake and regular exercise, its supplementation was found beneficial in blunting the notorious age-related decline in physical performance and energy metabolism, likely related to improved energy production in skeletal muscle. Green tea’s impact on weight loss is partially attributed to the thermogenic capabilities of green tea, a physiologic process that helps burn calories. Its thermogenic capacity is likely related to a synergism of caffeine and catechins which enhance sympathetic stimulation of thermogenesis, ultimately increasing energy expenditure. Research suggests that the major green tea EGCG alone can reduce fat accumulation. This reduction in body fat is mainly secondary to decreased energy absorption and increased lipid oxidation as shown in animal models and humans. EGCG acts mainly on the metabolism of dietary lipids through reduction in their absorption while increasing their oxidation. Green tea catechins were found to inhibit adipocyte (fat cell) differentiation in cultured adipocyte (fat cell) models. EGCG inhibited adipogenesis stimulated by fat synthesizing environment of insulin, dexamethasone, and 3-isobutyl-1-methylxanthine (IBMX) in a dose-dependent manner. Among all of the catechins, EGCG was the most antimitogenic and arrested preadipocytes at the G0/G1 phase of mitosis (cell division). The process of adipocyte differentiation is controlled by several transcription factors, including CCAAT/ enhancer binding protein beta (C/EBPβ), CCAAT/enhancer binding protein delta (C/EBPδ), peroxisome proliferator activated receptor gamma 2 (PPARγ2), and CCAAT/enhancer binding protein alpha (C/EBPα). C/EBPα and PPARγ work in conjunction to facilitate adipocyte differentiation through activation of adipose-specific gene expression while simultaneously promoting each others elevated expression. Green tea catechins therefore exert an anti-adipogenic effect by inhibiting PPARγ2 and C/EBPα. Studies with adipose cells show that green tea catechins activate genetic expression of adiponectin, a hormone produced and secreted by adipose cells that regulates the lipid and glucose metabolism Adiponectin levels enhance insulin sensitivity through fatty acid oxidation. Its levels were found to be diminished in obese, insulin-resistant, and Type II diabetics. It is therefore believed that appropriate adiponectin production plays a role in preventing insulin resistance and type 2 diabetes. 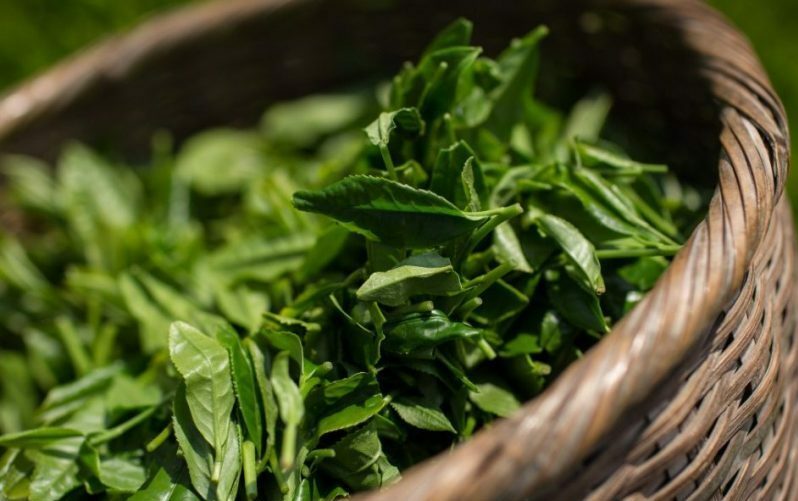 Green tea has exhibited the ability to thwart insulin’s maturation of fat cells, thereby inhibiting their ability to store fat. EGCG supplemented mice had significantly decreased fasting plasma insulin. A high-fat diet is shown in mice models and known in humans to result in insulin resistance – the metabolic result of excessive insulin stimulation from surplus dietary intake that can ultimately lead to Type II Diabetes. Research in mice models found the increase in insulin resistance due to a high-fat diet was reduced in those fed a high-fat plus EGCG diet. Caffeine stimulates thermogenesis and fat breakdown. Green tea’s ability to stimulate thermogenesis is not solely based on caffeine, given that the effect is greater than that which is associated with caffeine alone. Further, catechin polyphenols increased the respiration rate of brown fat thereby activating thermogenesis. Green tea extract (GTE) stimulates brown adipose tissue thermogenesis. When EGCG was added to a combination of caffeine and ephedrine, a synergistic activation of thermogenesis resulted. EGCG inhibits catechol-O-methyl-transferase(COMT) – which breaksdown the catecholamine noradrenaline – therefore enhancing the action of sympathetically released noradrenaline. Sympathetic nervous system activation increases thermogenesis, giving off extra energy as heat, counteracting excess energy intake, ultimately inhibiting weight gain. Catecholamines are increased during exercise, which promotes lipid mobilization and thermogenesis via β3-adrenoreceptors. Catechin supplementation with regular exercise significantly improved energy metabolism and physical performance. This implies that there is an interaction between catechins and exercise. Since catechins have been found to inhibit catechol-O-methyltransferase, catechins may boost the sympathetic stimulation of energy metabolism, particularly in conjunction with exercise. Catechin’s antioxidant effects may also play a role by diminishing the oxidative stress incurred by aerobic exercise. EGCG is able to diminish incorporation of dietary lipids into various organs and tissues. EGCG supplementation in mice switched to a high-fat diet reduced 13C-enrichment (a commonly used form of carbon in metabolic research), which translated into decreased dietary lipid integration into visceral white fat tissue, interscapular brown fat, skeletal muscle. Tea catechins are known to reduce visceral fat accumulation, potentially the result of reduced incorporation of dietary lipids into visceral fat. These mice had a decreased 13C-enrichment in plasma, suggesting that the circulation of diet-derived lipids has been reduced, which corroborates earlier tea catechin research findings of reduced triglycerides in the blood plasma of EGCG supplemented mice. Ultimately, green tea decreases adipocyte differentiation and lipogenesis, increases beta-oxidation, and decreases lipid absorption. Research reports decreased body weight and fat mass. These body fat lowering effects are hypothesized to be secondary to increased thermogenesis and fat oxidation. While there is still much research working out the metabolic details, existing data on this natural extract’s historic impact on health validates its potential as a supplement that can support weight loss, insulin sensitivity, and overall good health. S Wolfram et al., Anti-obesity effects of green tea: From bedside to bench Mol. Nutr. Food Res. 2006, 50, 176 – 187. R Hursel et al., Thermogenic ingredients and body weight regulation. International Journal of Obesity (2010) 34, 659–669. M Friedrich et al., Green tea reduces dietary fat incorporation. International Journal of Obesity (2012) 36, 735–743.